(Editor's note: For 2000, we are presenting a series of articles that examine the years around 1900. Our purpose is to provide a comparison of the beginning of the 20th Century to its upcoming end. 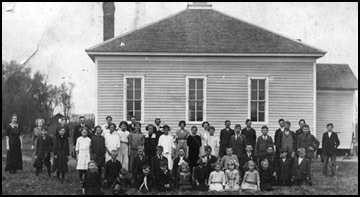 Schools were built early in the state of Minnesota, because pioneers understood how important education was. At the turn of the century, most children went to a country school within walking distance of their farm. For many, formal education ended when they graduated from sixth or eighth grade at the country school. A few went on to high school in Paynesville, boarding at homes in town. The students would do chores around the home in exchange for their board and room. At right: Zion District 43 was built in 1863 on Highway 23, east of Paynesville. The country schoolhouse was a one- room building with one door. This door led into an entryway or hall where the children's coats were kept. There were tall windows on two sides of the classroom. The teacher's desk was in front of the room with a round back wooden chair. There was also a globe of the world in the classroom and a Webster's Dictionary. A set of rolled up world maps hung over the blackboard. During the earliest years before electricity, kerosene lamps were used on the walls. Then later the Aladdin wall lamp, with its bright light was used. Electric lights came much later." Most children had to walk to school, some as far as two or three miles. School would begin with the ringing of the hand operated school bell. There would be three to four students in each grade with the teacher having about 35 students for eight different grades. Forrest McKinley recalls there being 42 pupils one year instead of the usual 35. He says, "and just imagine, the teacher handled them all. Sometimes she would use the ruler and hit across the fingers, you know, and they would mind her. In order to help the teacher, the seventh and eighth graders would help the first and second graders." The teacher would room and board at a nearby neighbor's house for about $15 a month. As a teacher, she made $35 a month. The rent ended up taking almost half of her pay. The teacher had many responsibilities, such as teaching all eight grades in the school, starting the wood fire every morning, and keeping the room clean and in order. Besides helping one another, students had other chores. Each day an older boy in the class would carry a pail of water from the river to the school. The children would use dippers and take turns drinking out of the pail. This same water was also used to wash blackboards. Later, a water fountain with a faucet was installed and students used their own drinking cups. The students also had to take the blackboard erasers outside and pound them together to get the chalk out of them, and they would have to sweep the floors. The schoolhouse had a wood burning box stove. The building was very cold when the seasons would change. Early in the morning on cold days, the shivering children would sit around the stove studying. On real cold days, the children's lunch pails, which sat closest to the outside wall, would start to freeze. The children would go to eat their lunch and the sandwiches had frost on them. Sometimes a student would put a potato for baking up on the top of the pot bellied stove to bake during the morning. Then at lunch time, he would have a nice hot baked potato. Other times children would bring in cans of beans and cook them on the stove. The cold permeated the room unless you were lucky enough to be close to the pot bellied stove. Students would volunteer to come up in front to recite, that way they were closer to the stove. Sometimes schools closed during the winter, holding only sessions in the spring and fall. In order to write, the children used bottled ink. The bottles of ink would fit into a round hole at the top right corner of their desk. If a student had forgotten to take their ink home over the night, they would come back to school in the morning and find a rock solid ink ball. In order to thaw the ink, it would have to be placed underneath the stove. County and state exams were sent to the teacher. She gave the tests to the eighth graders and then sent the tests back to the county superintendent's office. There, they were checked and recorded. Soon after, the marks were reported back to the teacher. School wasn't all miserable, though. The children had great fun at recess playing such games as: pump, pump; pull away; gray duck; London bridge is falling down, ring around the rosie, and fox and goose. There was always a Christmas program at school, put on by the teacher and pupils, and attended by everyone. Along with the program there was always a lunch; then everyone would go back home in a horse-drawn bob sleigh. "Basket socials" were held to raise money for something special at school. The neighborhood girls and women would prepare a special decorated basket or box filled with a delicious lunch for two. The men had fun bidding on the baskets. School often closed for the year with a neighborhood picnic where games, more food, and a social time was enjoyed by all. Walter Carlock (11.23.23-04.12.06) who went to school at District 152 in the 1930s, wrote his school memories in 1951. One man teacher was a farmer, also. He did his farming after school and in the evenings. This would make him very tired and he sometimes would fall asleep during the school day. One day when the teacher was sleeping, an older boy gave a younger boy a common pin and told him to stick the teacher in the rear end with it. After doing so, the young boy was to run out of the school. The younger boy did this, but it was the older boy who caught the blame for it. The boys brought a horse cutter sleigh to school in the winter time. The sides of it were gone, and just the runners with a platform were left. They could sit on the platform and steer it when they were out sliding. The older boys would sit on the platform and steer with their feet that were hanging down. The road that they would slide down had a curve in it. On the other side of this road there were trees, so if they boys missed the turn they would end up getting hurt. One time this male teacher said that he could stand on the sled while the boys sat and steered it. Once the boys got to the curve they steered toward the trees and jumped off, leaving the teacher alone on the sled headed for the trees. The teacher ended up sailing through the air and into the trees! The teacher never said a harsh word to them, but he never rode on the cutter again! One day Ivan Lister and Eddie Kelly were in a fight and Ivan was on top. Eddie's sister Maggie was watching this and decided that she would help her brother out. She went over to Ivan and planned on kicking him in the face, but to her surprise she got her leg pulled out from under her and fell into a fresh cow pie. After examining the disaster on her dress, she picked up a pile of her own and thrust it at Ivan, but he ducked and it went straight into Eddie's face. Eddie went home not feeling very well. During the Christmas program one year, the tree was beautifully lit by various candles. The tree was glowing brightly when Santa Claus (played by Mr. Johnson) came bounding in. He bent down to retrieve a package from under the tree, and next thing he knew he had a burning beard. The audience gasped at the tragedy as Santa beat the fire out with his arms as he rushed from the building. After being fed up with a male student, the teacher told the boy to go out to the woods and cut a branch for his spanking. The stick that the boy ended up bringing back was so rotten that it fell to pieces as the teacher used it on the boy. Since the teacher was even more upset, he went with the boy and showed him precisely which stick to cut and bring in. As the two were walking back into the school, the mischevious boy cut rings around the stick. When the teacher was going to give the boy his spanking the stick fell apart once again. Furious at this, the teacher took the boy over his knee. While raising his hand to spank the boy, he felt a sharp pang in his leg, the boy on his lap had bitten him. In the end, the boy got away without his spanking. Many times after a school program, the girls would have their lunch boxes raffled off. After this raffle, the guys would have lunch with the owner of that box. Of course, everybody would want the teachers, so hers would go for the highest price. Every girl was supposed to keep her lunch box a secret, but they would tell their favorite fellow which one was theirs in hopes that they would get to have lunch with him.  You will not marry during the term of your contract.  You are not to keep company with men.  You must be home between the hours of 8 p.m. and 6 a.m., unless attending a school function.  You may not loiter in downtown ice cream stores.  You may not travel beyond the city limits without the permission of the chairman of the board.  You may not smoke cigarettes.  You may not dress in bright colors.  You may under no circumstances dye your hair.  You must wear two petticoats and your dresses must not be any shorter than two inches above the ankle.  To keep the school room clean, you must: sweep the floor at least once daily; scrub the floor with hot soapy water at least once a week; clean the blackboard at least once a day; and start the fire at 7 a.m. so that the room will be warm by 8 a.m.
 Teachers may take one evening each week for courting purposes, or two evenings a week if they go to church regularly.  After ten hours in school, the teacher may spend the remaining time reading the Bible or other good books.  Every teacher should lay aside from each pay a goodly sum of his earnings for his benefit during his declining years so that he will not become a burden to society.  Any teacher who smokes, uses liquor in any form, frequents pool or public halls, or gets shaved in a barber shop will give good reason to suspect his worth, intention, integrity, and honesty.  The teacher who performs his labor faithfully and without fault for five years will be given an increase of twenty-five cents per week in his pay, providing the board of education approves.